Although the Tandem House is not completely done we decided to move in; just in time to host Thanksgiving with our family. Its been a whirlwind of a month as we not only needed to furnish the entire back tandem house (new), but we also prepared the front (old) house to rent as a short-term rental on Airbnb. We figured there was no reason to delay getting monthly rental income if we are ok living in the tandem house while finishing the final touches. While we live here we will continue to install remaining interior doors, baseboards, door trim, backsplash tile and a number of other smaller tasks. For now we are relishing in what we have done and not so much in what hasn’t. Its been a huge accomplishment to get to where we are and we want to enjoy it. We’ll keep it low key through the holidays and get back at it in the new year. But lets get to the good stuff; a photo tour of the house. As a reminder, the home is 2400sf in all, with 4 bedrooms and 3-1/2 baths. 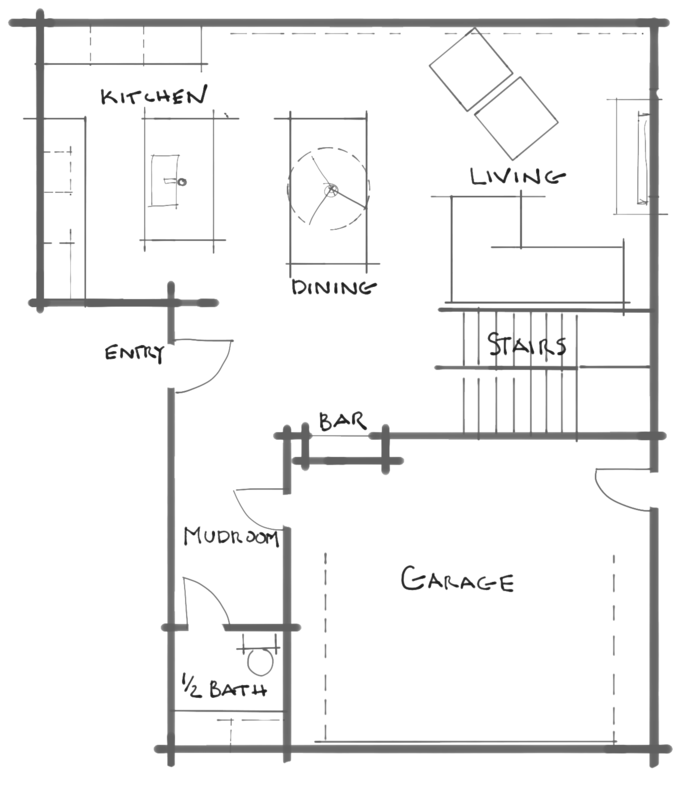 The adjacent plan of the first floor shows the open concept living, kitchen and dining area, the 1/2 bath off the mudroom and the 1.5 car garage. The stairs lead down to the basement and up to the second floor bedrooms. The contemporary architecture of the home is complemented by a mid-century modern interior decor.